As mentioned earlier in the review, our main focus today is going to be on the performance and value of the Sapphire HD 4830 with an overclock applied. These results will be compared to both the stock HD 4830 results, a generic HD 4850 and an XFX 9500GT thrown in for good measure as a representation of a once similar priced card from the green team. To ensure that each of the graphics cards has plenty of room to 'shine', the following overclocked test system will be used to remove the chance of any bottlenecks outside of the GPU. AMD Catalyst 8.10 / NVidia ???? The following list of games has also been chosen to test each of the cards on a number of popular game engines. Each game will be run at varying quality and AF settings at both low and high resolutions. During the benchmarking phase, we will be using the following prices extracted from ebuyer.com on 14/11/08 to produce our CPF (Cost Per Frame) graphs. Please remember that these graphs are static and only represent a snapshot of the market at the time of this review. Using only the the ATI Overdrive™ facility built into the driver control panel, the maximum overclock we were able to obtain from the Sapphire HD 4830 was 700MHz on the core and 1020MHz on the memory. This is an extremely impressive bump in performance considering the 575/900MHz stock speeds of the cards, and should go a long way to matching the performance of its bigger brother, the 4850. Had any of the other overclocking tools we attempted to use on Vista x64 worked with the HD 4830, we're fairly certain that the 700MHz core speed could have been increased further. Maybe not by much, but the card certainly felt like it had at least another 10-20MHz in the core before we would start running into problems. 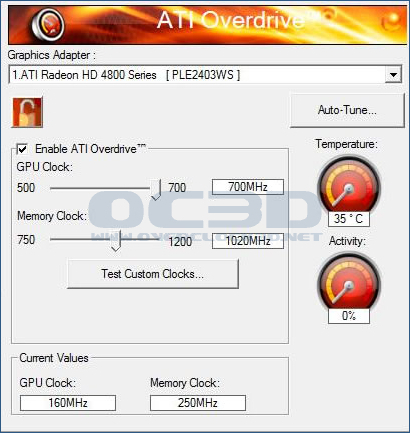 In addition, the "Auto-Tune" facility built into the drivers did attemt to overclock the Memory to 1090MHz. However as soon as we performed any kind of benchmarking or artifact testing, the entire system would lock up with a BSOD. nice review Jim.This looks to be a killer little card as there is some very interesting benches regarding these things in cross-fire(they beat "green teams" best cards on one or two games. It's a good comparison, but I do have to point out a few flaws. The 9500GT has to have been included as a joke. Anything nVidia release below a x600 can only be perceived as a multimedia/desktop card (even tho ALL gfxcards promote themselves as "great gaming performer" - that's shtick). It's always been the case with the x400, x200 etc. Hence they're around or below £50. Now if u did a pureHD comparison also, that'd be different perhaps. I have a 8400 in a media pc, and have no expectations of benching it against a 8600. If u popped in a 9600GT, as nVidia's base expectation for proper game playing, then we could perhaps be more serious. The costing ofc would be that much different, but also would be the performance. It is great that the 4830 can push it's elder brothers when it's oc'd, but what bothers me in the comparisons is that if u bought the brother - u'd most probably oc that too. Tricky.